I was invited to a brunch recently and was asked to bring something to share. I knew there were going to be breakfast dishes, fruit and sweet dishes so I decided to make something a little different, a shrimp salad. So I set off doing recipe research. I saw recipes that incorporated avocado into the salad and others that incorporated bell peppers and yet others that used cucumbers. 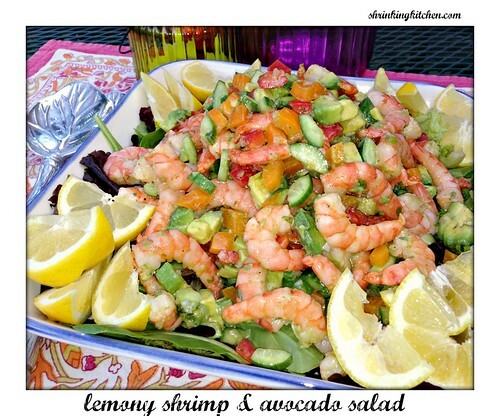 This is what I came up with, Lemony Shrimp and Avocado Salad. I made it without the tomatoes for the brunch and decided to add them when I served it for dinner. It was a hit at the brunch and my family loved it. It was such a cool, refreshing salad for a hot Texas summer day. Mixed greens and lemon wedges for serving. In a small bowl, whisk together lemon juice, vinegar, shallots, cilantro, garlic, salt and pepper. Continue whisking as you slowly add the olive oil. Set aside. Add bell peppers, cucumbers, tomatoes and half the dressing to shrimp. Mix to combine. Scoop the avocados from the outer shell. Dice avocado. Add the avocado to the shrimp mixture. Stir gently. Add more dressing to taste. Place a generous bed of mixed greens on a serving platter and top with the shrimp salad. Serve with remaining dressing and lemon wedges.